CBM Engineering is highly experienced in designing, manufacturing and maintaining custom production equipment for products that must meet the most demanding specifications established by the food, drug and consumer electronics industries. Our expert staff can design complete production lines, from simple conveyors to sophisticated production equipment and system controls. 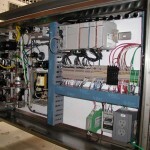 We also have the ability to upgrade and automate your existing system to increase production and/or lower reject rates. Complete management of hardware installation, system integration and training are provided. We will help achieve your production goals, no matter how large or small the project. CBM Engineering can deliver your production solution on time and on budget. CBM Engineering also has the capability to build custom panels which meet UL Guidelines or European CE Standards. Contact us for a quote on your next project or for any questions you may have.